The fight over who can profit from indirect ties to the Olympic Games is heading to trial. The Canadian Olympic Committee has indicated in court documents obtained by TSN that it is pursuing its watershed lawsuit against clothing maker The North Face. In a Dec. 2 notice of application filed in B.C. court, the COC alleges that the apparel company infringed on Olympic trademarks during the Sochi Games in Russia in February when it sold its so-called Villagewear Collection of apparel because "Villagewear" was see as alluding to the Olympic Village where athletes are housed. The North Face, meantime, accuses the COC of trying to restrict Canadians' abilities to express their national pride. The lawsuit highlights the ongoing battle by Olympics officials to stamp out the practice of ambush marketing, a term coined during the 1980s by the International Olympic Committee to describe companies trying to profit from a perceived tie to the Games without actually paying to be an official sponsor. Neither The North Face nor its parent company VF Corp. is an Olympic sponsor. The North Face marketed and released its line of Villagewear clothing in the weeks leading up to the Sochi games. After the COC complained, the company renamed its line the International Collection. It includes ski and snowboard jackets, winter hats and duffel bags in the colours and flags of various countries. The Canadian-themed items are red and white and feature a prominent maple leaf. Several items have a crest that reads "RU/14." The COC says that's a clear attempt to tie the product line to the Sochi Games. The Olympic committee's lawsuit, first filed in February, says items were marketed with names like "Men's Sochi Full Zip Hoodie." The product line "captures the international spirit of the Olympic Games," a company catalogue reads. "The plaintiff ... brings this action to address the defendant's wrongful conduct calculated to mislead Canadian consumers and other persons into believing (wrongly) that the defendant is an official sponsor or supporter of the Canadian Olympic Team," says the COC statement of claim, filed in B.C. Supreme Court. The COC's allegations have not been proven. The North Face marketed and released its line of Villagewear clothing in the weeks leading up to the Sochi games. In its statement of defence, The North Face challenges whether the COC even has the right to trademark the Olympic marks. The COC "has itself failed to adopt or use the alleged Olympic trademarks, and has never been the owner of the said marks, in that the marks have always been beneficially owned by the International Olympic Committee, not the COC," The North Face wrote in its pleadings. "None of the defendant's products or associated marketing ever used Sochi 2014... in any form," the pleading says. "(The North Face) has never suggested or implied that it was an official sponsor, supporter or licensee of COC, or that any of its products were connected to the COC by way of endorsement or otherwise... no Canadian consumer was ever misled or confused by defendant's products or promotions, or led to believe that there was any commercial relationship between defendant and COC." 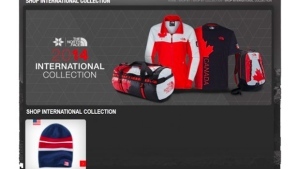 The North Face also alleges it has the right to use national flags of different countries on its garments and says the COC similarly has no right to stop companies from selling goods featuring the word Canada or those made using the national colours of a country. "COC does not own and should not be permitted to claim monopoly rights over common patriotic exhortations such as 'sport the colours of your home country', or 'show support for your favourite team competing in this winter's international competition'," The North Face says. Ambush marketing is a story line that plays out during every Olympics. Lululemon marketed clothing that referred to a "cool sporting event" taking place in B.C. during the 2010 Winter Games in Vamcouver The COC did not take legal action in that case, The Globe and Mail reported. 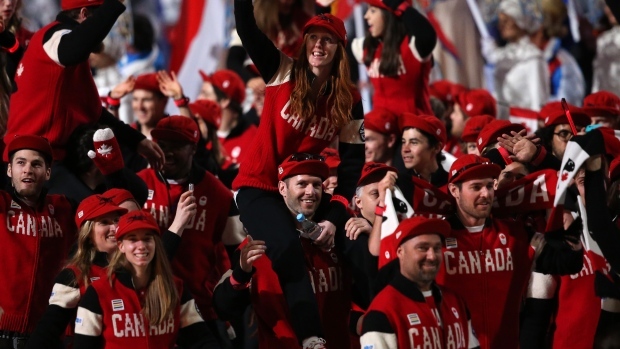 The Vancouver Olympic organizing committee also criticized Scotiabank for an ad campaign encouraging Canadians to "show your colours," and demanded telecom company MTS Allstream not run ads featuring speed skater Cindy Klassen during the Olympics. Two years ago, during the London Summer Games, Porter Airlines was forced to remove a Facebook illustration supporting Canada's athletes. For a time, Porter's Facebook page featured its familiar black and white raccoon mascot waving and holding a torch, accompanied by the caption, "Good luck to all who will be competing in the 2012 Olympics!" The Globe reported that in 2004, the COC launched a high-profile battle to force the Olympia Pizza and Pasta Restaurant in Vancouver to remove signs that featured the Olympic rings and torch. The restaurant owner pledged to defy the Olympic committee's demand and the signage has remained in place.